I was recently reading a copy of the June 8th Numismatic News and the cover story about the flowing hair 1794 silver dollar which sold for a record $7,850,000 - displacing a 1933 gold $20 double eagle which held the record at 7.59 million when it was sold at a public auction in 2002. Recently my wife Sherry and I were lucky enough to see that very 1933 coin, which is on display at the Federal Reserve Bank of New York . This coin and a host of other wonderful examples from Confederate half dollars to counterfeit bills are available for viewing at the Federal Reserve Bank. This display is sponsored by the American Numismatic Society and is a wonderful example of what our hobby is all about. If you are planning a trip to New York City, the Federal Reserve should be on your list. The tours are free, and you must make an application one month in advance. You will receive a confirmation number and a date and time for your golden tour. We began by presenting ID and entering through the obligatory metal detector. At that point we were allowed to peruse the money museum. We then were escorted to a short video explaining the federal reserve system. We found ourselves ushered into elevators and lowered 80’ below the surface of Manhattan to the bottom of the steel vault which is built on bedrock, the only substructure which can support the weight of tons of gold. The New York subway rumbled 20’ above us. The gold bullion in the Federal Reserve Bank is part of the monetary reserves of foreign governments, central banks and official international organizations around the world. By 1905 most of the world’s major trading companies had adopted the gold standard as well. In 1933, President Franklin D. Roosevelt imposed a ban on U.S. citizens buying, selling, or owning gold. Gold coins and certificates considered collector’s items were exempt from the prohibition. In August, 1974 President Ford repealed the prohibition on the public’s owning gold or engaging in gold transactions. Today no country bans private ownership of gold. As early as 2008, the Fed’s vault contained roughly 216 million troy ounces of gold valued at over 281 billion dollars at today’s price of gold. Each gold bar weighs 27.4 pounds and is valued at $520,000 at $1300 an ounce. Ninety- five percent of the gold stored at the federal reserve is foreign-owned with the United States owning only 5%. U.S. gold reserves are stored at Fort Knox, Kentucky, and elsewhere but the New York Fed has double the amount stored in Kentucky. Why does the Fed store foreign gold? The answer is that the foreign gold is stored at the Fed because of the world’s confidence in its safety as well as services that the bank offers and its location in one of the world’s leading financial capitals. How safe is the golden hoard? 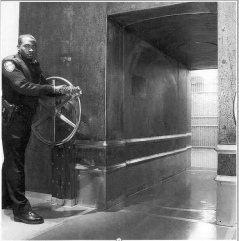 When the gold bars arrive by guarded armored trucks, they are remotely lowered by special elevators that are operated by a specialist in a distant room. 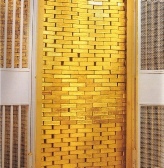 Armed guards accompany the gold to its final destination in the vault. The bank’s vaults are secured by the bank’s own uniformed protection force. Twice a year, each federal officer must qualify with a handgun, shotgun, and rifle. Most qualify as experts. All bank exits can be sealed in less than 25 seconds in case of a threat. We asked about 9/11 and, yes, it was locked down. Several years ago shots were heard coming from the direction of Wall Street two blocks away and again there was a lockdown. There are no doors into the gold vault. Entry is through a narrow ten foot passageway cut into a delicately balanced nine foot tall 90-ton steel cylinder that revolves vertically in a 140 ton steel and concrete frame. The vault is opened and closed by rotating the cylinder 90 degrees. An air tight and water tight seal is achieved by lowering the slightly tapered cylinder 3/8” into the frame like pushing a cork into a bottle. The cylinder is then secured in place when two levers insert large bolts, four of which are recessed into each side of the frame into the cylinder. It is a time lock and if locked inside you only have 72 hours of air to breathe. There are 122 triple locked compartments through which you can see and almost touch this midas hoard. Teams of “gold stackers” work in shifts that allow them sufficient rest periods. The job also has its hazards. To protect their feet from dropped bars, they must wear lightweight but very strong magnesium shoe covers which cost $500.00 each. Does the fed make any money for its services? The fed does not charge foreign countries for holding gold, but it levies a fee when gold enters, is moved within, or is shipped out of the vault. These funds are used to pay down the national debt. All compartments in the vaults are identified by a number, no names. The shape of the bar determines whether it was cast in this country or another country. American castings before 1986 are brick-shaped: 7” long, 3 5/8 “ wide and 1 5/8 “ to 1 ¾ “ thick. New castings and foreign castings are trapezoidal. Standard bars must be at least 99.5% pure gold. We saw dents in the tile floor where a stack of “bricks” had once fallen. Walls of gold gleamed down upon us. It was truly a king’s ransom.